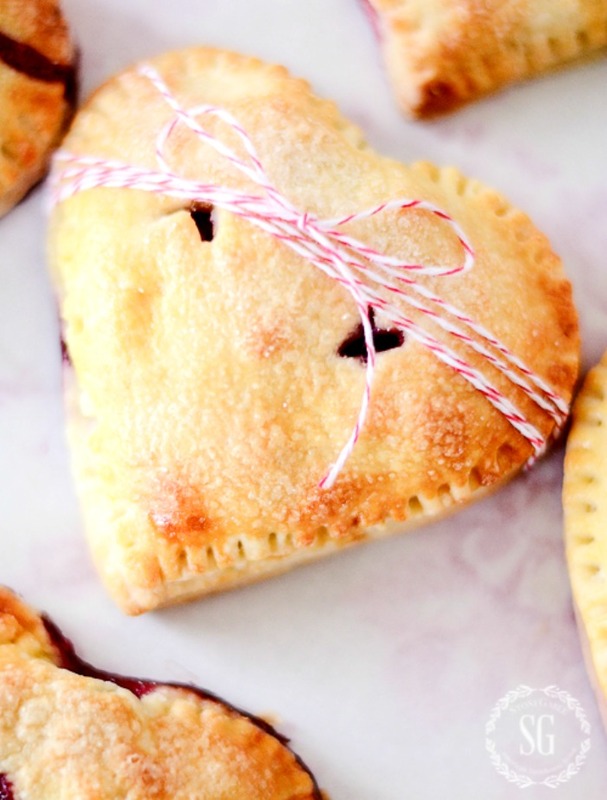 Aren’t these Valentine Hand Pies adorable? 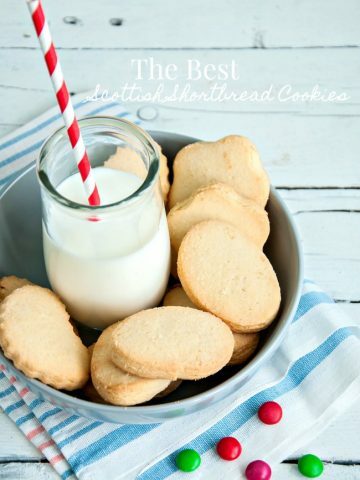 They are delicious and easy to make. They are the perfect way to say Happy Valentine’s Day to anyone you love! 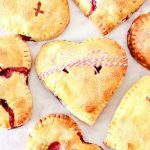 Let’s make Valentine Hand Pies! As many of you know, I am not a baker. But I have a thing for single-serve foods. And little hand pies were on my “must try” list. Because I have never made a hand pie before I turned to the expert of all things domestic… Martha Stewart. I just love all her doughs. They are perfection! And the dough for this hand pie was no exception. It was wonderful to work with and perfect to hold all that yummy filling! You can see Martha’s original recipe HERE. I just tweaked it ever so slightly to make Valentine sour cherry and blueberry/strawberry pies. Don’t let the directions scare you! They are VERY detailed to help you successfully make these darling little pies! A scrumptious heart-shaped hand pie filled with berry goodness! EAsy to make and a sweet treat for anyone on your Valentine list. Put sour cream and lemon juice in a small bowl and set aside. In a food processor, add flour, salt, and sugar. Whirl until mixed… just a couple of seconds. Add cold butter to flour mixture and pulse until butter is incorporated into the flour, about 15 seconds. Add ice water to sour cream and lemon juice. Whisk together. Add to processor and pulse until it makes a crumbly dough. Press the dough between your fingers to see if it sticks together. If it does not, add a few drops of water to the processor while it is running to mix. Check if the dough sticks together. The dough should not be wet or too “shaggy”. Shape the dough into two equal discs. Wrap each disc in plastic wrap and refrigerate for 30~ 45 minutes. The dough must be chilled to work with. Roll out each disc one at a time, to an average dough thickness, about 1/8″, and cut out 16 hearts with a large heart cookie cutter. My cutter was 3 1/3 inches tall and 4 1/2 inches at the widest part of the heart. Put the dough hearts onto 2 parchment-lined baking sheets and chill for an additional 15 minutes. Add the fruit to a bowl. Add sugar and corn starch. Mix and let sit for at least 5 minutes. *My cherries were frozen, thawed and the excess liquid squeezed out. I used fresh strawberries and blueberries and found them to be a much better filling. Use fresh fruit if possible. Mound 1 TBS of fruit mixture in the center of a heart cut out. This is a judgment call. The more fruit, the better the hand pies taste. But too much fruit make the hand pies hard to work with. Put water in a cup and using your clean finger, dip it into the water and run it around the edge of the heart cut out. Put a dough heart on top of the bottom heart with the filling and match up the edges. Using a fork, press the edges together so they are secure. Cut little x’s into the top of the heart to vent steam. Continue making the remainder of the little pies. Put the 8 hand pies on 2 parchment-lined baking sheet. Whisk the egg and water in a small bowl. Brush it over the pies. Sprinkle with sugar. Bake pies on two racks in the oven for 30-35 minutes. Watch them very carefully… don’t let the crust get too dark! The dough can be made up ahead and kept in the refrigerator for up to 2 days. I hope you will give these little hearts filled with sweet goodness a try! Thanks, Yvonne, for another wonderful recipe! We love “Hand Pies”! I am definitely going to make these for Valentine’s Day. I have tried so many of your recipes and everything is so delicious. And, Yvonne, you ARE a FABULOUS COOK! Please think about putting a cookbook together for all of us! 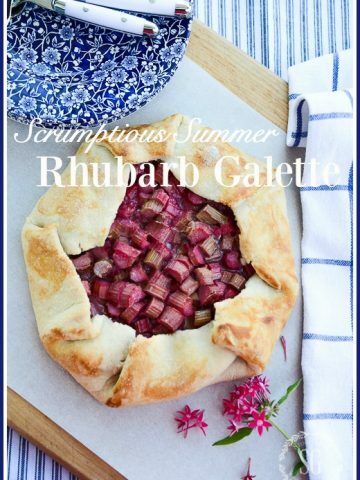 We would love to have YOUR cookbook! Blessings! I saw your blog about Valentine Hand Pies and thought they were so cute. So, on Tuesday, Valentine’s Day I made them for gifts. Mine were cherry. The project itself was a little time consuming but they turned out wonderful. Everybody loved them and they were yummy. Thanks for the great idea! These look scrumptious, can’t wait to give them a go. I love to bake pie so can hardly wait to try my hand at these sweet ones. Oh Yvonne, I’m making those precious heart pies for all my peeps! Thanks for a great and beautiful (probably delicious) idea! Cela a l’air d’être très bon et présentation originale. J’ai testé cette présentation pour la fête des rois avec des galettes individuelles garnies avec une préparation crème pâtissière et frangipane. Great job! Just beautiful! I bet they were delicious! I just love pie!!! I’m going to try these! Thanks for the Martha recipe!! I’m a big baker and for someone who dosent bake much ,you did a fantastic job! Your pies look perfect!!! For the UK how much is a ‘stick’ of butter please? Sorry, Tara! I should have put 8 TBS. Hope this helps! These are adorable, Yvonne. The recipe sounds really tasty. These look amazing! I wish someone would make them for me! Happy to be on the Valentine Home Tour with you. Yvonne, these look so delicious! They also look easy enough that even a non-baker like me could do it! Thanks for sharing! Retweeting and pinning! Do you know if this works with gluten free flour? I would love to make these for my husband and my daughter but my daughter is extremely allergic to wheat. Adorably cut pies and looks yummy too! Thanks for the recipe! Roll out each disc one at a time,” to an average dough thickness” ? When you make the dough you will split it into 2 parts and form them into 2 discs. After chilling them, roll them out with a rolling pin… just like you would regular pie dough. And roll them out to a thickness you would when you make pie dough. I did not measure them. Hope this helps. Enjoy! These are beautiful. I’ve been making pies for years but have never done hand pies. I love these. Yvonne those look so delicious! I wish I lived close enough to come on over for a taste! Okay I have never made a pie either but I think I could try and make these! You did a beautiful job photographing these sweet pies! These look amazing! I rarely make my own pie dough but may consider doing so for a special occasion like Valentine’s Day. Everything you make looks so delicious!! You have got the touch Yvonne!! Your pies look fabulous! 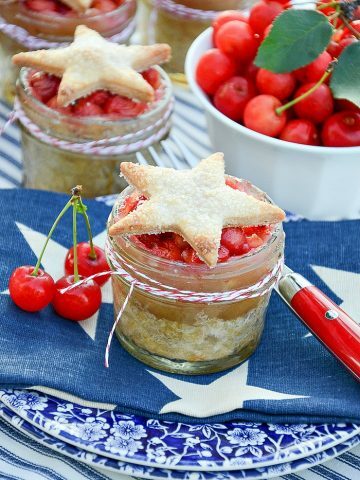 I would also make them for the 4th of July or picnics. Love hand pies and such a great idea for Valentine’s . . Thanks for the recipe and as always, your presentation is stunning! These look amazing, Yvonne! You’d definitely have my son’s heart with the cherry hand pies! Marvelous Valentine Tour post! Oh my gosh. These look amazing. I would definitely be the one eating them hot right from the oven! (Or for breakfast. Both work for me. lol.) I’m honored to share the day with you on the Valentine Tour. Hope you are well! Ann, these would be fabulous for breakfast! Thanks for the great idea! Yvonne, you should stop saying you are not a baker because these delicious looking pies are proving you wrong. They not only look delicious but they are so cute. Hope you are on the mend concerning your knee problem. I’m not much of a baker, either, but those might change my mind! I’m especially interested in the crust recipe — I’ve yet to find one I love. Thanks so much for this!! 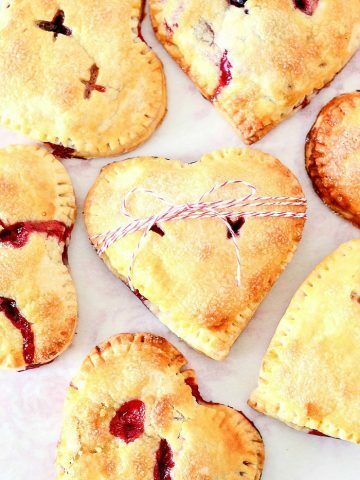 Oh your heart hand pies look delectable and oh so sweet Yvonne! Love the x shape vents for Valentine’s Day!